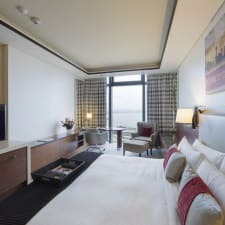 Offering the best city skyline and Caspian Sea views in the town Fairmont Baku, Flame Towers designed to exceed five-star standards and services, brings 299 superbly appointed guest rooms, suite and 19 serviced apartments. The spa-like marble bathrooms come with exclusive Le Labo Rose 31 bathroom amenities. Guests are offered rooms with a coffee machine. Limited number of rooms offers access to Fairmont Gold Lounge. Located on the 19th floor, Fairmont Gold Lounge offers exclusive complimentary service with soft and local alcoholic beverages and canapés. A rich variety of dishes is served at Le Bistro Restaurant, which offers French and local cuisine. Snacks, tea verities and shisha can be enjoyed at Nur Lounge Bar. Fascinating live jazz and signature cocktails are perfect in The Jazz Club on 3rd floor. Luxurious spa treatments are provided in SPA center, including hamam, sauna and a large variety of massages. Guests can also take a dip into the outdoor swimming pool or work out in the fitness center. Hotel offers free wireless internet access in all guest rooms.